I regularly read the BBC Good Food magazine. A few weeks ago I was paging through the August issue hoping to get some inspiration for a Saturday night dinner. I found a Gordon Ramsay recipe of marinated lamb steaks with barley salad and thought that was it: lovely whole grains, broad beans (I must admit, I never had before, and they are absolutely delicious) and grilled lamb. 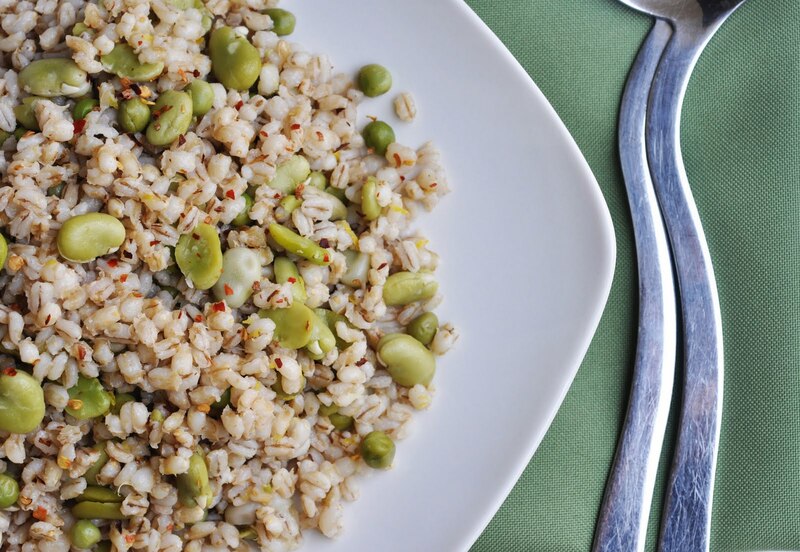 Within a month this barley salad has become one of our favorite side or main dishes. It goes well with any kind of grilled meat or fish. Any leftover salad is good enough for a tasty, wholesome and healthy lunch, either heated up or at room temperature. Barley is an amazing grain. 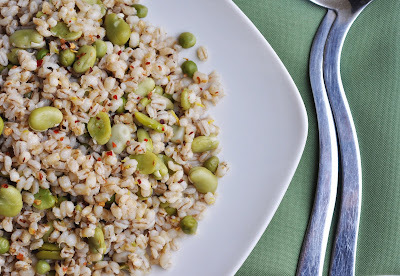 I love its chewiness, something between brown rice and wheat berries. It has a low GI, and doesn't take much longer to cook than brown rice. I find this salad open to many variations as you can swap the veggies or increase the veggie amount according to season and your taste, or whatever your fridge is providing. I made this salad so often now that I tweaked it a little to accommodate our taste. Below is the recipe with these little tweaks incorporated. Bon Appetit! Cook barley in boiling, salted water until tender, but not too soft, about 20-30 minutes. Cook the peas in the same pan for the last two minutes. Drain of excess water and rinse. Set aside. Cook the beans in boiling water for 2-3 minutes. Drain and let cool a little. Take the skins off the beans and add them to the pea barley. Heat the olive oil in a large pan. Cook the red onion until softened. Add the barley with peas and broad beans and heat through. Add lemon zest and lemon juice. Season with salt, pepper and chili flakes.